When painters start to delve into the world of display painting, not much is discussed in regards to composition. We have a bunch of painting and theory tutorials out there but not much actually discussing composition. The aim of this blog post is to explain the difference between plinths and bases, firstly. Then to discuss how to determine maximum heights for your entire composition. For the purposes of this blog, I will explain the difference between a "plinth" and a "base". The Plinth is the handle to which the entire scene will be affixed. The Base is the scene created with which to provide context. Ok, so we have some basic definitions and you can see the photographic examples I have provided. File these definitions away while we move on to discuss the aspects of harmonizing your plinth choice and your basing in order to create a complete composition. Before we continue, I want to discuss what makes a "composition" in art. In Visual Art, Composition refers to the use of various elements to create a whole. The elements used are color, texture, shape, line movement, positive and negative space, contrast, pattern, emphasis (focus) etc. Essentially, all of the various 'parts' used to create a scenic display piece, are your visual elements with which you create your composition. The Plinth is most often thought of as the handle on which to stick your basing and figure to allow the viewer to pick up for observation. This is a single function of the plinth, when in reality it has a dual function. It also serves as a way to frame your work. You don't want the plinth itself to become the focal point for your composition. You want it to help present your composition to the viewer without getting in the way. 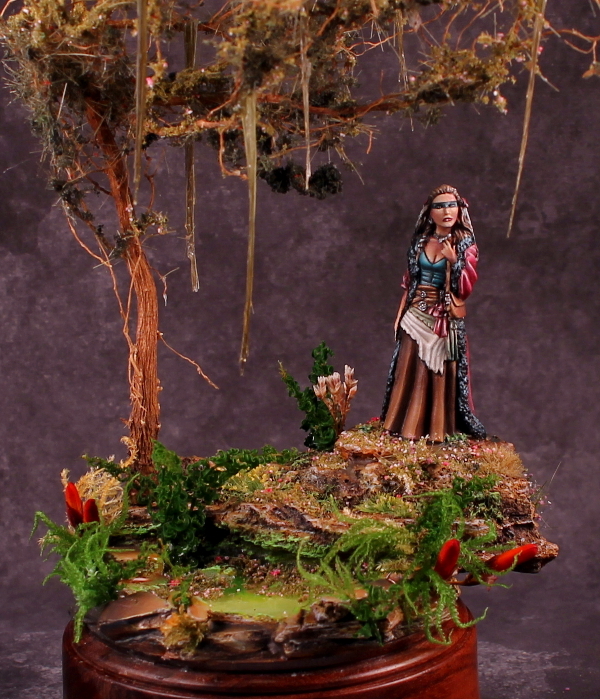 In Miniature Painting there are two trends with regards to plinths that are most popular. The first, is getting a nicely turned and finished plinth. The second, is using a block or puck and painting it black. Both of these methods are acceptable however, there are considerations you have to make, as the artist, as to which you will use. When using a block/puck, you don't want to paint it a bright color because it will over power your whole composition. The blocks used are very solid both physically and visually. By bringing attention to this very solid structure your model is affixed to, your model is now fighting for visual superiority. Painting it black allows the block to recede into the background as your eye moves over it. Black is a neutral color which means it doesn't engage the eye first. It is seen only as a supporting element. 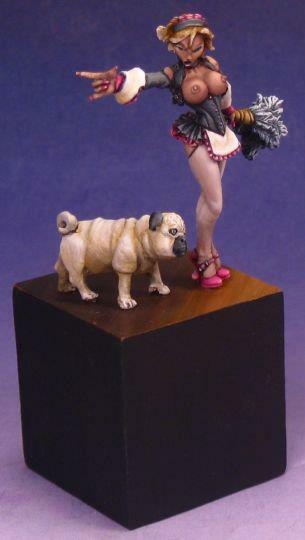 Allowing your brighter colors in your model and basing to shine. The lines of a block are straight and clean so they won't get in the way of your composition. Straight lines are very neutral when off in the background. 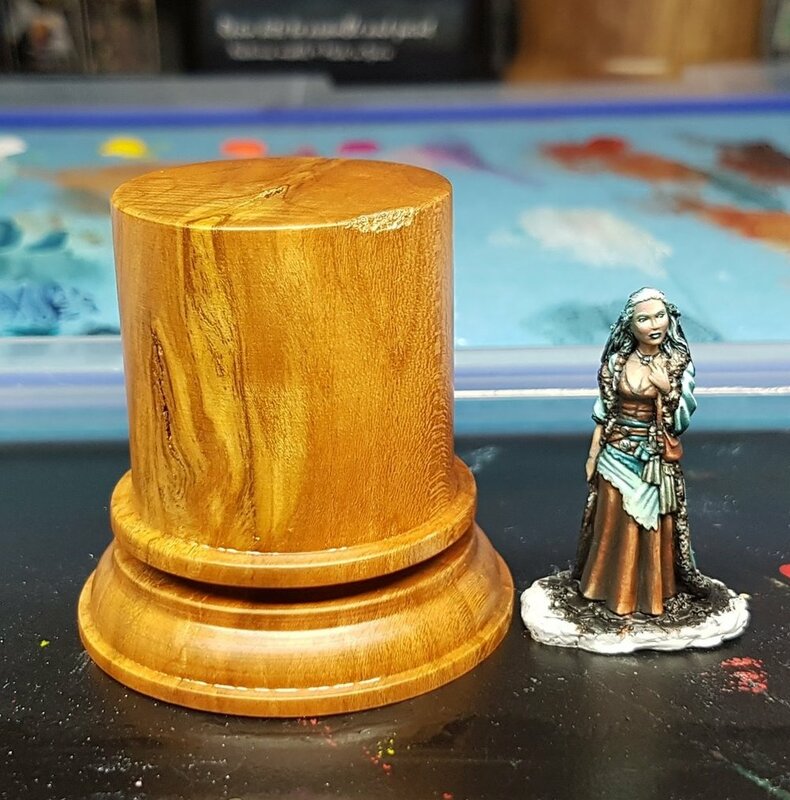 When using a turned and finished plinth, you have to think about a few different elements in order to make sure it doesn't clash with your finished composition. First, you have to consider how the lines of the plinth work with your composition. Choosing between a round plinth and a square plinth also affects how people will view it. Round plinths encourage people to turn the entire piece around. This means your piece needs to look excellent in a full 360° turn. If you are using a squared plinth, you can limit the viewer to a few angles. Beyond determining style of plinth, you also need to consider the height of the plinth. This is the biggest problem I see when people are starting to get into Display Painting. They tend to think of the plinth as being a separate element instead of it being an incorporated element in regards to the entire composition. The end result is often a base that is visually and physically out of balance, often it is too big for the subject matter (the figure) and people want to "try to be different" without first understanding the rules to composition. Yes, there are rules in art. There are rules about how to make a visually pleasing and stimulating design. You first have to understand the rules and how to implement them before you can bend or break them. The General Rule for Maximum Plinth Size is: 1 times the height of the model. The General Rule for Max Basing Height: 2 times the height of the model. Total Max Height For Composition: 3 times the height of the model. This equation above is following The Rule of Thirds in regards to Art and Design Principles. This is a Guideline and does not have to be followed exactly. Just keep in mind that the plinth factors into your composition and the max composition height shouldn't exceed 3 times the height of the model. Believe me, even on a 28mm figure, that is a lot of space to fill! I have a recent example of this from one of my students in New Zealand, Gavin Dodd. I have received permission from him to use his photos and to discuss the process. I believe he has only done one display piece before, which we discussed at my most recent Wellington, NZ class. Immediately upon looking at the photo, you can see where the focal point is as opposed to where it should be. Keeping in mind the models are supposed to go on top of the block, in front of the sign, the green dot is where the focal point *should be*. Instead, it is squarely at the corner of the building (where the red dot is). This happened because the plinth for the base was too tall. When Gavin posted this up, he explained that he wanted to create height to force to viewer to feel like the models are up high on a roof. I can totally understand this! However, by using the extra height at the bottom of the plinth, he just forced the focal point elsewhere. Instead of trying to create the height by using the plinth, you need to create the height on top of the plinth. Which he had also done by creating the sign. Additionally, by using such a tall plinth and then creating such a tall base element on top of the plinth, the center of gravity is lifted. Why is this important? Well, that plinth has a small footprint when compared to the total height. If you are going to take this to a show and someone accidentally bumps into the case or table it is displayed on, this piece is going to topple a lot easier than a piece that has a lower center of gravity. Not only do we need to make sure we use the correct design principles to determine composition height, we also have to think about the physical stability of the piece. I advised him to cut the plinth shorter to redistribute the focal points. I also advised to get rid of the Target Identified sign because when you add a label, you are forcing the viewer to see what you see. If your composition doesn't match what your label says, it can cause confusion and the viewer spends more time trying to reconcile the label with what they are seeing. As opposed to letting them take in all of the elements and creating their own story. So much affects the way different people read the same image based on what their mood is at the time, their personal experiences in life, what sorts of stories they favor. Basically, everyone's perception is shaped on their own life experiences and we should allow the viewer to create whatever narrative they want as opposed to trying to pigeon-hole your personal concept. Anyway, so he cut the bottom of the plinth off and removed the sign. He also extended some of the brickwork a bit. In the end, he came up with a much more pleasing composition. This scene, already tells me a lot more about the setting by adding a few more elements and fixing the focal point. I can tell they are on a rooftop of a building. That is quite clear because of the lip of the wall, the flat roof and the vertical sign element. An illusion of height is created by extending the sign upwards. Even so, he probably could have removed another centimeter off the bottom of the plinth and it would be a perfect height. But that is getting really knit picky. In the end, for his second display base, he put a lot of effort into this and took on the critiques from me and some of the other Kiwi Painters like a champ. 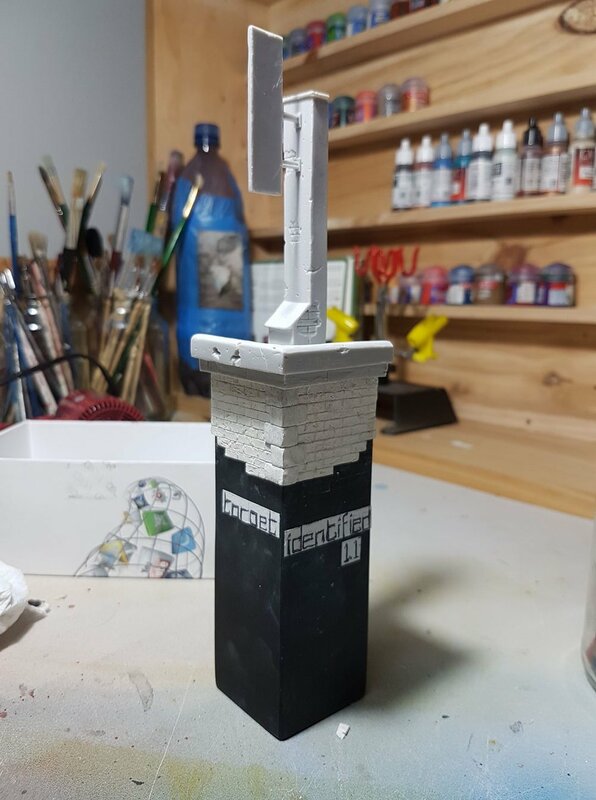 I wanted to close by saying that you can always incorporate some of your basing directly into your plinth, as Gavin did here by putting the brickwork down the sides of his plinth. I have also done this on my Steampunk Ariel piece I painted a few years ago. Don't think of your plinth a a separate entity. It is part of your entire composition and as such, it needs to compliment or accent your display. I hope this is helpful for my readers. Writing this blog I already have so many ideas on discussing design elements and how to utilize them in your miniature painting. I will try to get a few written up to release to you guys while we are in Europe! Don't worry. Paint and be happy!